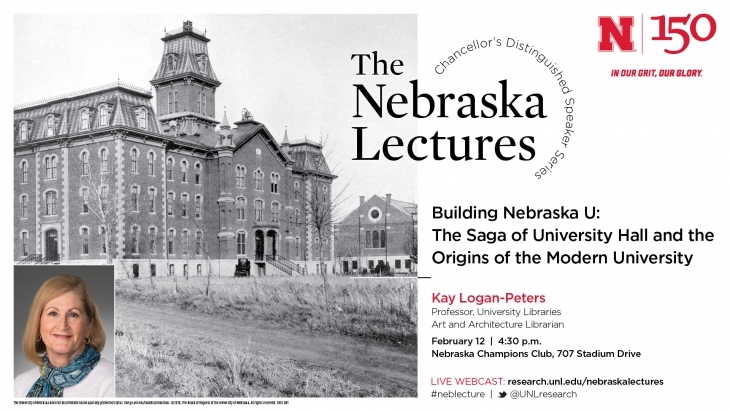 The Nebraska Lecture with Kay Logan-Peters, “Building Nebraska U: The Saga of University Hall and the Origins of the Modern University” will be webcast Tuesday at 4:30 p.m. CST. View it here. This is a live webcast, and the feed will be inactive until the presentation begins. If you access the feed early, refresh your browser to view the webcast once it begins. An archived presentation will be available at the Nebraska Lectures website within one week for later viewing.